A bit of publicity about pipeline opposition. 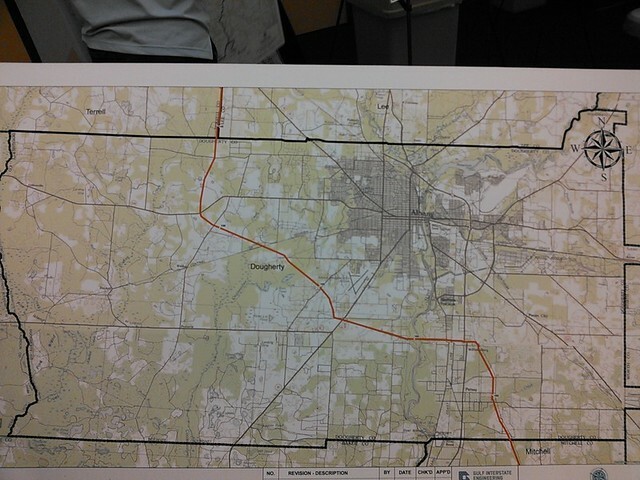 The proposed Sabal Trail Pipeline could potentially come through a portion of Dougherty County. But if a determined and growing list of landowners in Georgia, Florida and Alabama have a say in the matter, no Spectra Energy-financed shovelful of earth will ever be turned. The spectrabusters.org website is a clearinghouse site for all issues surrounding the proposed Sabal Trail Pipeline that would supply natural gas for energy conversion by Florida Power & Light Co. Most of the concerns center around the environmental and economic impact the pipeline would have on property in Georgia and Alabama and the safety record of Spectra Energy. They seem fond of reminding us that they have the rights to imminent domain and that if we do not cooperate they will just take our land. The article also notes the post about Gasland II showing at VSU (7PM Thursday 7 November 2013; thanks SAVE!) and No Gas Pipeline’s lawsuit in New Jersey. Spectra’s Sabal Trail Transmission office for South Georgia is in Albany. A member of Spectrabusters, who asked that his/her name not be published, said he/she is still refusing to cooperate with Spectra representatives even as the threat of imminent domain proceedings mount. “They send me letters, and they call, but I still say no,” the anti-pipeline activist said. “They haven’t explained to my satisfaction how this pipeline will impact my property, and until I’m satisfied that it’s completely safe, I will continue to say no.